Social Mobility for the 21st Century addresses experiences of social mobility, and the detailed processes through which entrenched, intergenerationally transmitted privilege is reproduced. Contributions include (but are not limited to) family relationships, students’ encounters with higher education, narratives of work careers, and ‘mobility identities’. The book intends to challenge both the framework of the more traditional approach, and the politicisation of mobility which casts ‘mobility’ as a possession, a commodity or a character trait, and threatens to castigate the ‘non-mobile’ as carrying a personal responsibility for their situation. 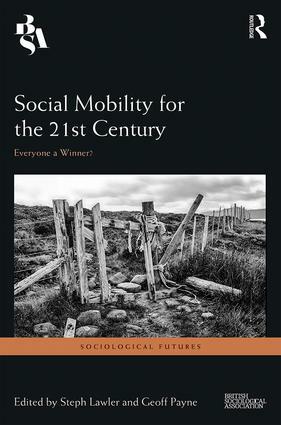 This book presents critical analyses of routes into social mobility, the experience of social mobility, and the political and social implications of social mobility’s ‘panacea’ status. Drawing on the work of established scholars and more recent entrants, the chapters offer a fresh look at social mobility, opening up the topic to a wider readership among the profession and beyond, and stimulating further debate. This book will appeal to higher level students and scholars of sociology alike, as well as having a broad cross-disciplinary appeal. One of the key strengths of the book is its discussions of mobility experiences of typically under-researched groups and of mobility in differing contexts. Mallman’s chapter documents habitus development of working-class families in Melbourne, Australia; Gardner, Morrin, and Payne’s chapter explores care-leavers’ adaptable habitus in relation to their higher education experiences; Sohl focuses on the racialised and classed experiences of mobility in newly neoliberal Sweden, while Giazitzoglu provides insights into the mobility experiences of self-employed childless men. This widens the scope and appeal of the book to a variety of audiences both in and outside of the United Kingdom. Steph Lawler is a Reader in Sociology at the University of York. Her work considers identities, not in categorical terms, but in terms of how identities become produced and reproduced, approved or disapproved. She has written widely on the ways in which various social ‘troubles’ rest on concerns about what kinds of persons there are and there should be. She is the author of Mothering the Self: Mothers, Daughters, Subjects and Identity: Sociological Perspectives, as well as articles and chapters on social mobility and, more widely, the social relations of class and gender. Geoff Payne, FAcSS, is a Senior Research Associate at Newcastle University. He was Director of the Scottish Mobility Study at Aberdeen University in the mid-1970s, subsequently producing over fifty articles and five books on social mobility. His The New Social Mobility was published by Policy Press in January 2017. A former President of the BSA, and winner of the 2012 HEA National Award for Excellence in Teaching Sociology, he has been an advisor for the Ministry of Justice's Social Mobility Strategy. He has served on the Editorial Boards of several leading Sociology journals, and has edited a number of books including his widely used Social Divisions.